Mayford House Surgery is excited to be able to provide its patients with the ability to send medical queries through to the practice in and out of hours. 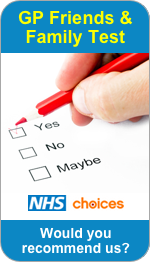 Find out more about online consultations here. Call 01609 772105 during our opening hours. Please note that we do not offer a 'walk in' appointment service. Patients may make appointments to see the clinician of their choice by using our on-line service (SystmOnline), calling at the Surgery in person, or by telephoning the Surgery when it is open. An appointment should be made for each person requiring a consultation. On arriving for your appointment please check in on the computer provided, or report to the receptionist. If there are no routine appointments available we offer a “sit and wait” clinic starting at 11:30am for those patients who feel they need to be seen that day. Patients booked into this clinic will be seen in order of arrival (unless having an urgent medical need) by all available doctors. A specific doctor cannot be guaranteed. After 11am, calls for urgent appointments will be forwarded through to the on call doctor. Further information can be found on our 'Urgent Problems and Out of Hours' page. Please do not ask for a home visit unless the patient is too ill to come to the Surgery. For further information please see our 'Home Visits' page. If you anticipate that you may require an examination by the Doctor and feel that you would like a chaperone to be present, please make reception aware at the time of booking your appointment so that this can be arranged. For further information please see our Chaperones policy. Please call us on 01609 772105. You can send us a fax us on 01609 778553 to cancel your appointment.